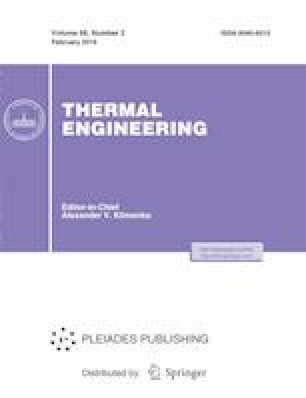 In this paper, we experimentally determined the conditions and characteristics of the ignition of the fuel mixture samples of various composition of crushed coal and wood in stationary air heated to high temperatures (from 600 to 1000°C). The heating of fuel mixtures under study that are promising for heat power engineering and their subsequent ignition and combustion were registered by using a high-speed video camera (image size is 1024 × 1024 pixels, frame rate is up to 105 frame/s), which ensures high reliability of the obtained results. The ignition delay times of all the studied mixtures based on lean and long-flame coals were established to decrease with an increase in the wood fraction. The limits of the stable (with small deviations of the delay time from the average values) ignition of weights of the studied mixtures are selected. At an increase in the wood waste fraction up to 50%, the decrease in the ignition delay time of mixed fuel based on grade T coal was found to be 11.2% at 600°C and 55.3% at 1000°C. For fuel mixtures based on grade D coal and wood, similar indicators are 17.6 and 64.3%. At temperatures typical for the furnace environment (approximately 1000°C), the ignition delay time for such fuels was determined to be less than 1 s, which is significantly less than the similar ignition characteristics of long-flame and lean-coal dust. The ash content of the fuel mixture is established to be a nonadditive characteristic relative to the ash content of the corresponding coal and wood. The increase in the wood fraction to 50% leads to a decrease in ash content to 10.44% for grade D coal and to 11.08% for grade T coal. This work was supported by the National Research Tomsk Polytechnic University, project no. VIU-IHE-300/2018.